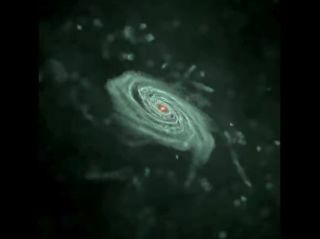 Simulation of the formation of a galaxy similar to our Milky Way. Massive black holes lurk in the centers of many of the building blocks that merge to assemble the galaxy, and a black hole also inhabits the final galaxy. Still from video released August 2, 2012. Black holes have long been cosmic mysteries, even as research in the past decade has shed some light on the largest of these dark objects and how matter pours into them. Scientists say the many remaining puzzles include how the largest black holes were born at the dawn of the universe and how black holes may help shape the fate of galaxies. "The whole field of 'massive black holes in galaxies' really developed in its own right in the last 12 years, and now it's one of the hottest in astronomy," Marta Volonteri, an astrophysicist at the Institute of Astrophysics in Paris, told SPACE.com. Volonteri is the author of a study on the evolution of the largest black holes appearing in the Aug. 3 issue of the journal Science. Black holes have gravitational pulls so powerful, nothing can escape, not even light. Astronomers began mulling over the possibility of black holes in 1783, and scientists used Einstein's theory of general relativity to predict black holes in 1916. One of the most popular theories about the formation of massive black holes links them with the first generation of stars. However, recent simulations suggest these stars were no more than a few dozen times the sun's mass, Volonteri said ? too small to easily achieve the mass of the largest black holes. One alternative scenario proposes that massive black holes originated from stars up to 1 million times the sun's mass born from gas that rapidly accumulated over less than about 2 million years. Another model suggests the kernels of massive black holes were born from dense clusters of stars in the centers of galaxies that merged to form stars up to a few thousand times the sun's mass, which in turn collapsed to create black holes. Curiously, astronomers recently discovered that billion-solar-mass black holes existed when the cosmos was less than a billion years old. Scientists are at a loss to satisfyingly explain how such massive black holes could have formed so early in the universe's history. After a certain point known as the Eddington limit, the energy released by matter rushing toward a black hole should halt the flow feeding that black hole, restricting how large it can grow. Although it is possible that billion-solar-mass black holes could have formed in less than a billion years after the Big Bang, "all odds must be favorable to the black hole, so only lucky black holes can make it," Volonteri said. Scientists are now exploring whether or not black holes can overcome the Eddington limit and grow at so-called super-Eddington rates. "That would make black hole growth easier," Volonteri said. It remains a hotly debated question whether these massive black holes dominate how their galaxies grow or vice versa. Perhaps the energy these black holes release alters the overall evolution of galactic structures, or perhaps galaxies control how much gas falls into these black holes and thus regulate how large they grow. Another possibility is that massive black holes and their galaxies develop symbiotically. In the next few years, a variety of telescopes may help answer this question by providing a better look at black holes in multiple wavelengths of light, from radio, infrared and visible light to X-rays and gamma rays, Volonteri said. It is difficult to study the evolution of massive black holes because they take so much time to develop. However, stellar-mass black holes may help shed light on their larger cousins, since they evolve on humanly accessible time-scales and because as many as 100 million stellar-mass black holes may be scattered throughout the Milky Way. Stellar-mass black holes are often paired with normal stars in systems known as X-ray binaries. In the past decade, X-ray observatories have helped scientists learn much about how stellar-mass black holes pull matter from their partner stars. In turn, these findings are helping astrophysicists understand how massive black holes do the same thing, said study co-author Rob Fender at the University of Southampton in England. X-ray binaries apparently can emit bright outbursts of radiation lasting months to years. Researchers suspect the temperature of the disk of matter accreting onto black holes rises as its mass grows, eventually ionizing the hydrogen within. This increases the viscosity of material in the accretion disk, making it easier for it to slow down and get dragged into the black hole. This increased rush of matter into the black hole is apparently what causes the outbursts of radiation from these systems. Eventually the flow of matter into the black hole slows as the accretion disk runs out of material, which makes the disk cool down, resetting the cycle. This cycle of activity seen with stellar-mass black holes in X-ray binaries is providing insight into the formation and power of the jets and bursts seen from massive black holes. This titanic activity releases energy that shapes their surrounding galaxies. An accretion disk was recently detected swirling tightly around a massive black hole — apparently the remnant of a star that wandered too close. Intriguingly, this material seems to be very near the black hole's event horizon, the boundary beyond which nothing escapes. "By analyzing signals from this material, we can test the predictions of Einstein's theory of general relativity, which is quite exciting," said Rubens Reis, an astrophysicist at the University of Michigan, who authored another study in the same issue of Science.